Primary thallus: squamulose, persistent; squamules: 3-9 mm long, 2-5 mm wide, deeply laciniate to palmately lobed, sparingly to abundantly sorediate along margins of underside podetia: 8-45 mm tall, 1-2 mm wide, green to gray-green, unbranched or sparingly branched; apices: subulate or bearing very small (up to 2 mm wide), shallow cups surface: ecorticate and sorediate above, lower portions corticate; cortex: thinning or almost lacking, not reaching high up on podetia or to cup interiors; soredia: farinose Apothecia: rare, up to 1.5 mm diam, brown ascospores: ellipsoid, 10-16 x 3-5 micro meter Pycnidia: inferquent, on tips of podetia, ovoid, with hyaline gelatin conidia: 4-8 x 0.5-1.5 micro meter Spot tests: K- or K+ dingy yellow to brownish, KC-, C-, P+ orange to brick red, UV- Secondary metabolites: fumarprotocetraric acid complex (the minor satellite convirensic acid probably less frequent than in C. ochrochlora). Habitat and ecology: on rotting wood and tree bases, rarely on bare soil World distribution: Asia, Europe and North America; temperate-boreal Sonoran distribution: Arizona, Baja California, and Chihuahua. Notes: Cladonia coniocraea and C. ochrochlora are morphologically very similar, and some authors are inclined to unite them. The present treatment is provisional. The squamules of C. coniocraea are always deeply incised, whereas the margins of the squamules of C. ochrochlora can be nearly entire. 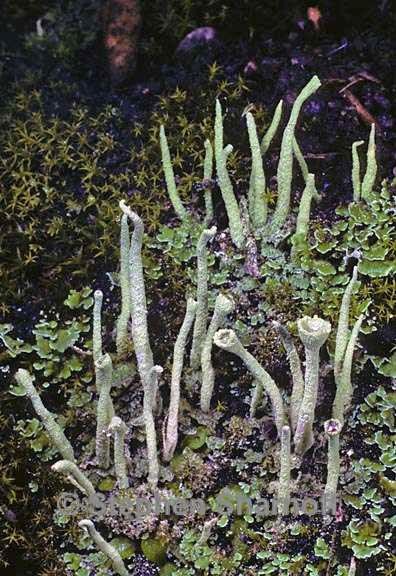 Cladonia coniocraea is usually found without cups, but C. ochrochlora rarely lacks them completely. The base of the podetium in C. coniocraea is only thinly corticate, while the cortex of C. ochrochlora is thick, extends beyond the immediate base, and is often longitudinally rugose. The soredia of the present taxon are usually farinose, rarely occurring in small, diffuse soralia; soredia in C. ochrochlora are variable, but are usually larger than those of C. coniocraea, and often largely occur in well defined, erumpent soralia. The podetia of C. coniocraea are greenish rather than gray, fairly slender, usually not more than 1.5 mm diam., and are usually straight. The podetia of C. ochrochlora have a grayish tint, are generally thicker, and are often somewhat branched and twisted (Hammer 1993). The nomenclatural status of the names C. coniocraea and C. ochrochlora is open; their retention requires conservation. Other species easily confused with C. coniocraea include C. norvegica, C. bacilliformis, and C. macilenta (barbatic acid chemotype), but they all react P- rather than red. The thamnolic acid chemotype of C. macilenta is distingished by a P+ yellow reaction. See also notes under C. subulata.